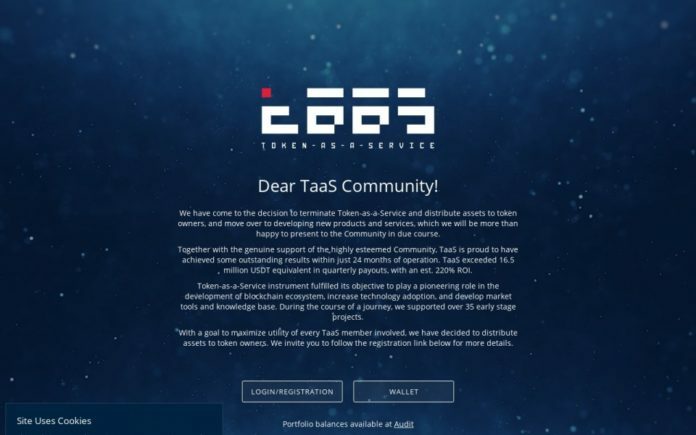 TaaS or Token-As-A-Service is closing down. An early pioneer in the ICO arena, they launched at the beginning of 2017. “I am proud of our team for continuously over performing the blockchain market benchmarks and generating alfa. We love this constantly evolving industry and will stay dedicated to blockchain and cryptocurrency. I would also like to express my gratitude to 15,000+ community members for placing their trust in us,” said Ruslan Gavrilyuk, co-founder and President of TaaS. developed a range of tools, including the Cryptographic Audit, a suite of analytics and monitoring tools accessible to any member of the public who currently owns or considers purchasing TaaS has fulfilled its objective of making smart contributions and providing its initial 3,942 members and subsequent token holders with returns on their contributions. “While some people see the situation as bad, I still see TaaS as the project which “got me in the space” (made me want to work in blockchain/crypto) and I’ll always be grateful to them for that since well, I do work in that today. It was a fun adventure for me. I’ll remember my nights of not sleeping and answering people in this channel over panics and questions. From day one, TaaS aspired to provide high transparency standards in the blockchain space. Prior to starting trading on various exchanges in May of 2017, TaaS ICO results were first independently verified by a world-renowned accounting firm Grant Thornton. TaaS has been constantly informing the public on every single contribution or partnership, and published detailed quarterly and annual reports similar to those required from the publicly-traded companies. A total of 70 detailed press releases have been distributed during its 26 months of operations so far. 32.5 million USDT equivalent, resulting in an aggregated 780% annual growth rate. TaaS is expected to exceed 16.5 million USDT equivalent in quarterly distributions, as a result of the 24 months of operations, thus providing over 220% ROI and 275% ROA. At the beginning of May 2019, TaaS will publish the results of its eighth and final fully-operational quarter (Feb. 1- Apr. 30). The token membership wind-down procedure will commence immediately, and the underlying assets will be distributed to the users who have completed the Authorization procedure in accordance with TaaS Compliance Policy. At the time of this publication, total assets are 10.72 million USDT equivalent while the total supply of TaaS tokens is 8,146,000.78. The exact payout amounts allocated for the final distribution will be published at the beginning of May. 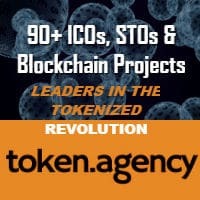 TaaS tokens have been created to benefit from the operations of an Ethereum-based smart contract, which offers token owners 50% of the quarterly gains while 25% of the results are retained in order to increase the capital pool and the remaining 25% to be used by management to grow operations and remunerate the team. TaaS token holders are encouraged to visit the official website for detailed instructions about the process of receiving their pro rata distribution. What will the distribution comprise of? Liquid, movable, tradable assets. These assets will be converted into ETH for the purposes of the distribution. Movable assets with low liquidity. Unless there is a reasonable opportunity to sell, or otherwise dispose of these assets, the distribution will be carried out ‘in specie’ (for ERC-20 tokens only), meaning an Authorized User shall receive an amount of such ERC-20 tokens pro rata to the amount of TAAS Tokens submitted for distribution. Assets that are immovable, locked, not yet received, in transit, non-liquid, or otherwise not available for either conversion into ETH, or distribution ‘in specie’. Unless there is a reasonable opportunity to sell, or otherwise dispose of these assets prior to the end of 2020, the relevant rights and obligations to dispose or sell such assets in the best interests of the Authorized Users will be transferred to a third party custodian/administrator. Such custodian/administrator will be requested to treat the proceeds from such assets in a way described above in paragraphs 4.a) and b). However, if there is no reasonable way for the custodian/administrator to sell or otherwise dispose of these assets within two years from accepting these rights and obligations, the custodian/administrator may value such assets at nil. Such assets will be distributed to the whitelisted wallets of Authorized Users by means of an Ethereum-based smart contract, pro rata to the amounts of TAAS Tokens received from such wallets. For the purposes of distribution, all liquid assets will be converted into ETH. Assets with limited liquidity will be distributed ‘in specie’ (ERC-20 tokens only). The total amount of assets available for distribution to the Authorized Users will comprise of the total amount of the underlying assets less a two (2) percent fee to cover the costs of termination of Service. The amount of ETH for distribution will depend on the liquidity of the underlying assets, market environment during liquidation (including order books. rates, slippages etc.). In order to mitigate the exchange risk, the assets liquidation process may take up to 10 days. For information purposes, the list and amounts of the underlying assets are updated at the Cryptographic Audit page on a daily basis and reported quarterly. Incorporated in Singapore in February of 2017, Token-as-a-Service (TaaS) has been actively contributing to the development of the blockchain ecosystem. Owners of the TaaS token capitalized on the rise of the blockchain markets without dealing with the hurdles, risks and technical barriers associated with owning, transferring and trading cryptocurrencies and tokens. Kastelein has an Ad Honorem – Honorary Ph.D. and is Chair Professor of Blockchain at China’s first Blockchain University in Nanchang at the Jiangxi Ahead Institute of Software and Technology. In 2018 he was invited to and attended University of Oxford’s Saïd Business School for Business Automation 4.0 programme. Over a half a decade experience judging and rewarding some 1000+ innovation projects as an EU expert for the European Commission’s SME Instrument programme as a startup assessor and as a startup judge for the UK government’s Innovate UK division. He is a Canadian (Dutch/Irish/English/Métis) whose writing career has ranged from the Canadian Native Press (Arctic) to the Caribbean & Europe. 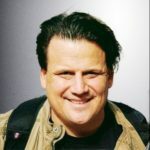 He’s written occasionally for Harvard Business Review, Wired, Venturebeat, The Guardian and Virgin.com, and his work and ideas have been translated into Dutch, Greek, Polish, German and French. A journalist by trade, an entrepreneur and adventurer at heart, Kastelein’s professional career has ranged from political publishing to TV technology, boatbuilding to judging startups, skippering yachts to marketing and more as he’s travelled for nearly 30 years as a Canadian expatriate living around the world. In his 20s, he sailed around the world on small yachts and wrote a series of travel articles called, ‘The Hitchhiker’s Guide to the Seas’ travelling by hitching rides on yachts (1989) in major travel and yachting publications. He currently lives in Groningen, Netherlands where he’s raising three teenage daughters with his wife and sailing partner, Wieke Beenen.